Why is this Filipino favorite called “Buffalo” Wings? The post Why is this Filipino favorite called “Buffalo” Wings? appeared first on When In Manila. Contrary to common misconceptions, buffalo wings are not actually made from buffalo. And no, buffalos don’t have the ability to fly neither. So, many people are puzzled by its strange name. But we’re here to tell you that they’re actually chicken wings. Delicious, deep-fried, tossed-in-sauce chicken wings, that is. If you’re still curious about the origin of the dish’s name, the first plate of buffalo wings was served in a family-owned establishment called Anchor Bar in Buffalo, New York in 1964. Simple as that. The thing is, it was so innovative because Americans didn’t use to eat all parts of the chicken. Unlike us Filipinos who eat everything from the liver to the intestines–and sometimes even the feet. Bellissimo coated the wings in a homemade spicy sauce consisting of vinegar and butter. She served them with a side of celery and blue cheese dressing as a way to balance the spice of the chicken and cool off their taste buds. Today, buffalo wings are sometimes served with ranch sauce instead, but traditionalists still prefer the original blue cheese combination. Although some critics still claim that this was not an invention of the Bellissimo family, they are still credited as the ones who started it all. We can never know for sure but whatever the true story is, it gave birth to this tasty snack and has since then become a staple in bars, restaurants, and barbecue parties across America. Buffalo wings were introduced to Filipinos not too long ago and unsurprisingly, they’ve become a huge hit. We just can’t get enough of chicken! It’s a bit difficult to find traditional authentic buffalo wings here in the Philippines, but you may want to consider visiting Buffalo’s Wings N’ Things. They offer 15 different sauces ranging from mild to hot to cater to all taste buds though you should definitely try their New York’s Finest if you want the Buffalo, New York experience. The Rookie is also an option for those with a lower tolerance for spice. 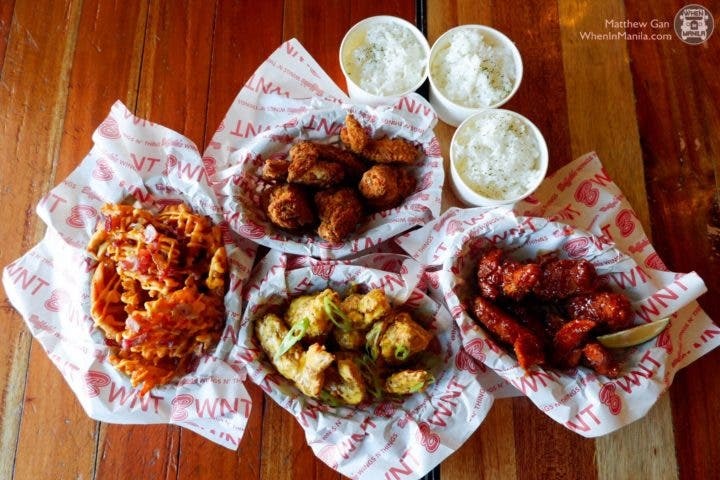 Buffalo’s Wings n’ Things is one of the biggest chains in the Philippines with 45 stores operating nationwide. What’s great about this particular chain is that they’re not limited to Metro Manila and their food can be enjoyed by Filipinos living in Tuguegarao, Naga, and even Zamboanga! Not only are they affordable, but very accessible as well. Buffalo Wings N’ Things also used to have a secret sauce that changed every three months but with summer fast-approaching, they have decided to reveal their secret with the launch of these new flavors: Creamy Salted Egg, Sweet Smoked Chipotle, and Louisiana Cajun Spice. The Creamy Salted Egg sauce is their take on this trending flavor beloved by Filipinos and the creamy texture with the crunch of the skin unleashes a delightful savory explosion. The saltiness also doesn’t overpower the flavor of the egg yolk. This flavor was actually offered as a limited-time offer before, and due to insistent requests, Buffalo’s Wings n’ Things has decided to enhance its creaminess and offer it again. Buffalo wings are known for their spice but we all know how Pinoys love their sweets. The Sweet Smoked Chipotle sauce has just the right combination of sweetness from honey with just the right kick of smoked chipotle. The Louisiana Cajun Spice is a dry rub that has a peppery spice instead of a chili-based one. You can taste paprika, pepper, garlic, onion, and other herbs all in one chicken wing. It also resembles traditional fried chicken with its flaky, crunchy texture. These will be available in all stores starting from March 15, 2019. All three flavors are a must-try, so gather your buddies, head to the nearest branch, and get your hands on these yummy wings!